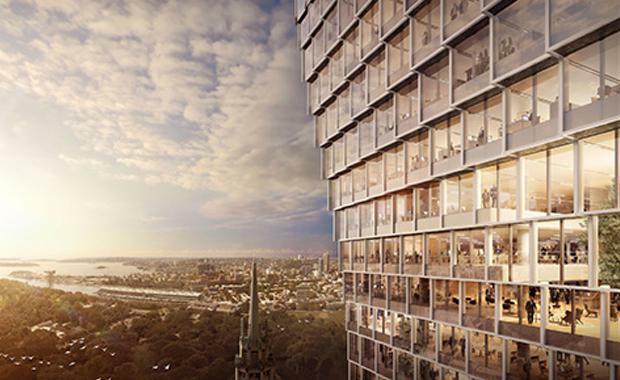 Investa Property and Gwynvill Group, for the $750 million redevelopment of 60 Martin Place, Sydney. City of Sydney have officially approved plans for the site this week and General Manager of Commercial Development for Investa, Mark Tait believes the design will create a new landmark in the CBD. “The Hassell proposal provides a unique, landmark building which would add vitality and quality to the mix of buildings in the CBD, while responding to the individual requirements of the site,” Mr Tait said. Hassell’s winning design incorporates just over 40,000 square metres of lettable area and 32 levels with an integrated, connected ground plane design. The design features sandstone cladding on the podium façade and activates all three frontages on the lower and upper ground levels as well as the provision of three lobby entrances.